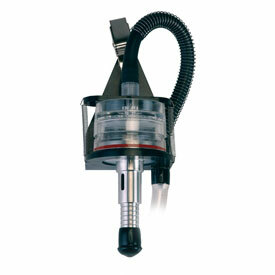 Zefon Aluminum Cyclone for Respirable Dust with Holder - SanAir Technologies Laboratory, Inc. 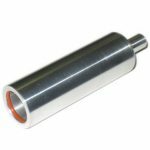 The Zefon Respirable Dust Aluminum Cyclone with holder is used in conjunction with 25mm or 37mm 3 piece open face filter cassettes to separate dust particles by size with the respirable particles being collected on the filter and larger particles being removed. The collection efficiency curve meets the standards set forth by ACGIH/ISO/CEN for a respirable curve with a median 50% cut point of 4µ at 2.5 LPM flow. * Performance tests indicate no statistical difference between the SKC Aluminum Cyclone and the Zefon Aluminum Cyclone. Fully interchangeable with the SKC cassette/cyclone holder. This products comes complete with both the Zefon Aluminum Cyclone (#ZA0060 or #ZA0075) and the Zefon Universal cassette/cyclone holder #ZA0061. Cassettes not included and shown for illustrative purposes only.